Paredes is a former Commissioner of the SEC and currently the CEO and founder of Paredes Strategies LLC, a financial regulation advisory group. The former Commissioner explained that in the commercial corporate world exist more than 200 businesses, which have reached $1 billion size without the benefit of a public offering of securities. These firms have become to be known as “Unicorns.” The term reflects the uniqueness of the financing of such companies. Historically, most developing firms which reached that size, because of investor purchases of ownership, have done it through a public sale of securities. Not so with Unicorns. 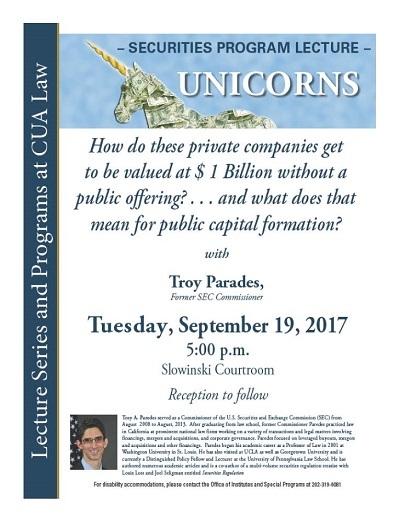 Paredes, Troy A., "Unicorns in the Land of Securities Law" (2017). Securities Law Program Lecture Series. 2.